Flow cytometric analysis of HT-29 cells using c-Myc/N-Myc (D3N8F) Rabbit mAb (PE Conjugate) (solid line) or concentration-matched Rabbit (DA1E) mAb IgG XP® Isotype Control (PE Conjugate) #5742 (dashed line). 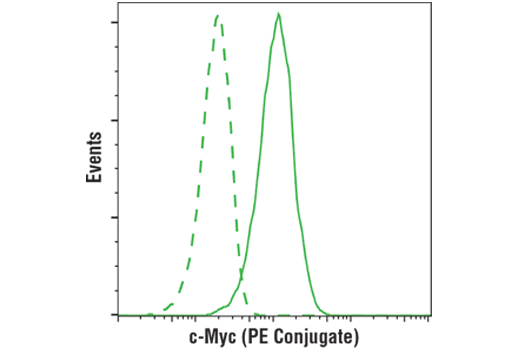 c-Myc/N-Myc (D3N8F) Rabbit mAb (PE Conjugate) recognizes endogenous levels of total c-Myc and N-Myc proteins. Monoclonal antibody is produced by immunizing animals with recombinant protein specific to a central region within human c-Myc protein. This Cell Signaling Technology antibody is conjugated to phycoerythrin (PE) and tested in-house for direct flow cytometry analysis in human cells. This antibody is expected to exhibit the same species cross-reactivity as the unconjugated c-Myc (D3N8F) Rabbit mAb #13987. Members of the Myc/Max/Mad network function as transcriptional regulators with roles in various aspects of cell behavior including proliferation, differentiation and apoptosis (1). These proteins share a common basic-helix-loop-helix leucine zipper (bHLH-ZIP) motif required for dimerization and DNA-binding. Max was originally discovered based on its ability to associate with c-Myc and found to be required for the ability of Myc to bind DNA and activate transcription (2). Subsequently, Max has been viewed as a central component of the transcriptional network, forming homodimers as well as heterodimers with other members of the Myc and Mad families (1). The association between Max and either Myc or Mad can have opposing effects on transcriptional regulation and cell behavior (1). The Mad family consists of four related proteins; Mad1, Mad2 (Mxi1), Mad3 and Mad4, and the more distantly related members of the bHLH-ZIP family, Mnt and Mga. Like Myc, the Mad proteins are tightly regulated with short half-lives. In general, Mad family members interfere with Myc-mediated processes such as proliferation, transformation and prevention of apoptosis by inhibiting transcription (3,4). Blackwood, E.M. and Eisenman, R.N. (1991) Science 251, 1211-7. Henriksson, M. and Lüscher, B. (1996) Adv Cancer Res 68, 109-82. Grandori, C. et al. (2000) Annu Rev Cell Dev Biol 16, 653-99.